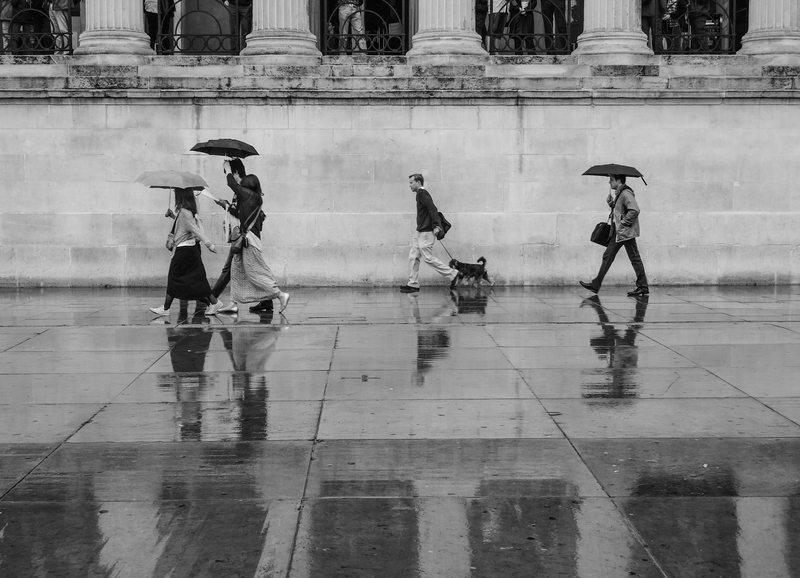 Chris shot his rainy day in London on a Nikon P7700. However, apart from the odd portrait shoot I don’t get (or create) the opportunity to photograph people all that much, so shooting street candids was a real change for me. 2. What did you notice about the experience of shooting street photography? 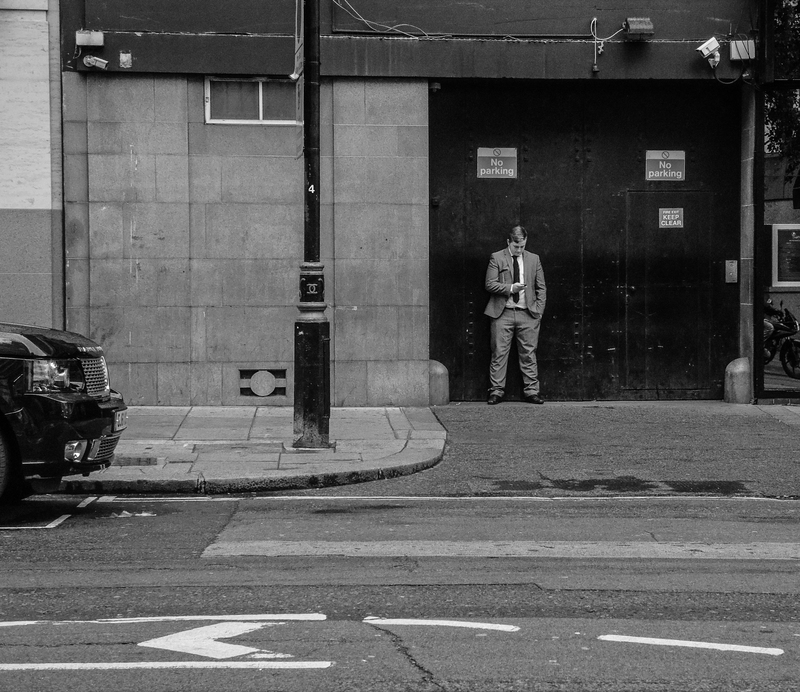 I didn’t consciously set out to ‘shoot street’ – I was in London for the day and had a few hours to kill. It was raining and I thought I might be able to get some nice shots in the reflections on the pavement. I set off from Kings Cross into town, camera in one hand and umbrella in the other. I set the camera to b&w as I thought that would make for more atmospheric shots – this is also pretty unusual for me as I rarely shoot in b&w, or even convert to b&w in post, for that matter. When I’ve looked at other street photography projects or exhibitions there’s usually some element of photojournalism – a sense of purpose or story behind the work. In some ways I wish I could say that I set out with such a purpose in mind, but I can’t. I just took shots as they caught my eye. I suppose you could say that I was looking for a certain aesthetic, a combination of human and urban elements that looked like they would make a good composition, but it was only really after the event that I thought about what I’d been doing as “street photography” and decided to put the shots together in an ebook. 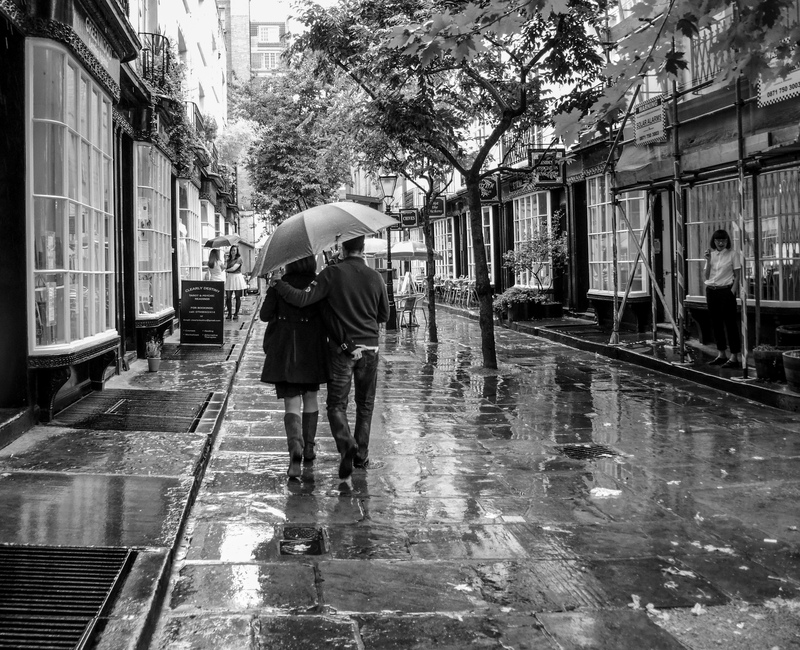 London in the rain makes for some great street scenes. I really enjoyed the experience. Even in the rain. 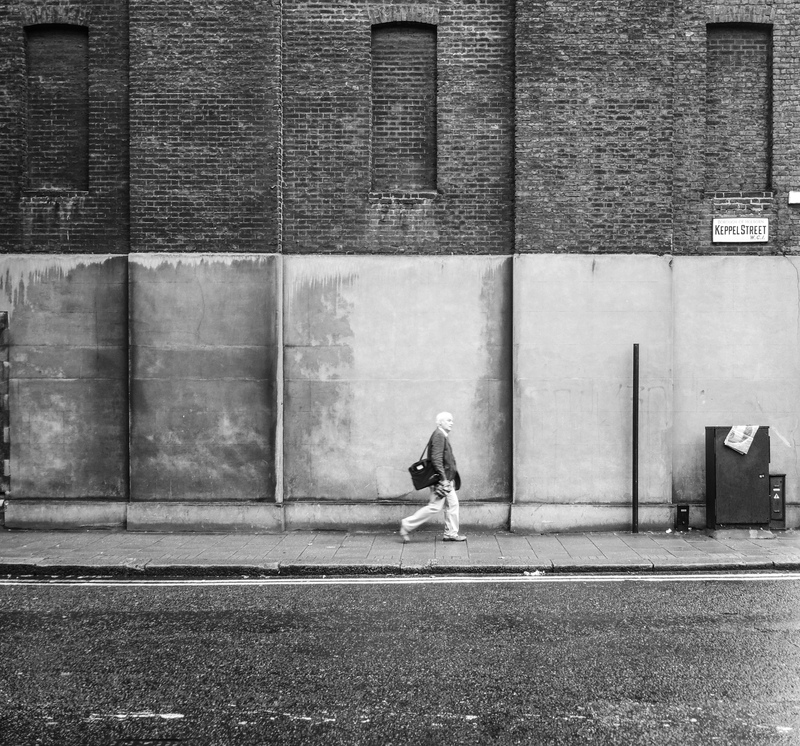 London is a great place to feel anonymous and lose yourself in the crowd. There are so many other people waving cameras around, particularly in Trafalgar Square* where I feel I got my best shots. If people did notice me taking photos, I don’t think anyone thought that I was taking photos of them. Also, because I was using my compact camera, I could simply wear it round my neck and shoot from the chest. I would often take the shot, then wait for the person to go past and pretend to take another shot, in the hope that they thought I was waiting for them to get out the way. Probably fooled no-one. There were a couple of times I saw a photo opportunity but wasn’t brave enough to take it. There was one in particular when three men in white painters’ overalls were walking along on the other side of the road. Every time I looked round one or other seemed to be looking at me and I chickened out. 3. What gear did you use? I had my backup camera which is a Nikon P7700 and an umbrella. Nothing else. 4. Any gear that you would have liked to have used? Nothing that springs to mind – it was good to travel light for a change. I only got the Nikon this year and had spent a while researching more serious compacts. I felt the Nikon offered the best combination of sensor size, focal length and lens speed. It was a toss-up between that and the Canon G1X. At about £100 cheaper I went for the Nikon. *I realised after the event that you need permission from the Greater London Authority if you want to use photos taken in Trafalgar Square commercially. Fortunately, when I wrote to them and asked if I could make my photos available for sale in an ebook they gave me permission retrospectively. This entry was posted in Photography by Peter Thomson. Bookmark the permalink.